Recently, I was watching Dr. Phil do another intervention for a severely addicted woman who looked half dead from drug addiction. The family identified that she was regularly using five drugs including: heroin, Xanax, pot, Oxycontin, and of course alcohol. Having watch Dr. Phil over the years I’m seen him use all different strategies for interventions. Some times he is gentle and forgiving and other times he brutally forceful to the point of being rude. Regardless of which tactic he uses what he is trying to do is to MAKE them want to get clean and to go into treatment and recovery. Trying to get them to care! When dealing with a person addicted to drugs or alcohol, getting them to care is usually the hardest battle to win. You’re not just dealing with denial, you’re trying to get past their own despair and self-loathing. I worked with a man who lost his eighteen year old daughter to a rare form of cancer and really didn’t trust God anymore. Life as he understood it was gone. The grief overtook him and the ONLY thing that seemed to help was alcohol. I had a patient in counseling who was sexually abused throughout her entire childhood by her brothers and sometimes their friends. She still doesn’t understand why they did it and why her parents didn’t stop it. She has been in treatment more than ten times and once went to jail rather than treatment. She is 42, drinks bottles of vodka daily and looks like she is 70 years old. The question for these two cases and many others are these cases hopeless? Can treatment and recovery really help these people? My answer is YES, there is always hope until someone is dead! How can people who chronically relapse from treatment be helped? The “lost cause” cases that are described above are not without hope, but the addict has to decide that they are willing to accept help. Often their self-esteem is so low that it’s almost impossible for them to accept help from anyone. If you’re dealing with addict like this I’d recommend that you CONTINUOUSLY tell them that you love them but that they MUST get treatment. You also must not help them to stay addicted in any way. If they live with you and use you must kick them out. You can’t give them ANY money for any reason. Recovery from drug addiction usually includes the 12 Steps. Almost everyone I’ve spoken to that has been in long-term recovery go there by working the 12-steps. Recovery starts when the addict gets over their denial and admits they’re totally and completely powerless over their addict. Once denial is broken down the recovery process begins to take over. Many people may relapse a few more times but they get back to recovery MUCH quicker and start to work the steps again. Why do the 12-steps work for recovery from drug addiction? I believe the 12-steps work well because they contain many elements many commonly used psychological theories and they also contain a strong spiritual component. They keep addicts get rid of “stinky thinking”, deal with their childhood and any other abusive situations as well. They also have the addict tap into the power of their higher power so that their feelings of self-loathing can be forgiven. Receiving forgiveness, hope and grace from God is one of the most powerful experiences that the addict can have and can usually help them to love themselves enough to stop using. Finally, the 12-steps has the addict begin to teach others and give back. This is SUCH a powerful part of the 12-steps. It allows the addict to really tap into and appreciate their value and help many other people along the way. What a fantastic program. If you’re trying to help some recover from drug or alcohol addiction or you yourself are trying to stop using, JOIN a 12-step program. Go to AA, NA, CA or Celebrate Recovery and work the steps DAILY. 90 meetings in 90 days can be a great step to stop using and to join the recovery community. Sadly, the patients I described at the beginning of the page refused and are no longer living. Drug addiction is a fatal disease so the addict is either in recovery or dying there is nothing in the middle. 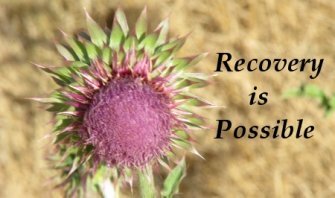 That completes this page on Recovery from drug addiction, visit our home page for more info or return to drug abuse causes.